MH140201 Haunted Library (2010); Mill Hill; Buttons and Bead Kits; Autumn Series; Beads,ceramic button, perforated paper, floss, including glow-in-the-dark thread, needles, chart and instructions. glow-in-the-dark-thread; Mill Hill; Buttons and Bead Kits; Autumn Series; Beads,ceramic button, perforated paper, floss, needles, chart and instructions. 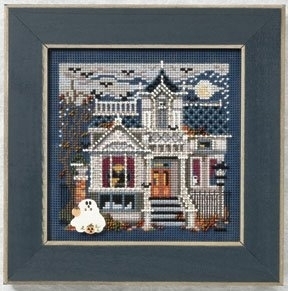 Mill Hill frame GBFRM13 sold separately ; 5.25" x 5.25"
MH146204 Boo House (2006); Mill Hill; Buttons and Bead Kits; Autumn Series; Beads, ceramic buttons, perforated paper, needles, floss, chart and instructions. Mill Hill frame GBFRM2 and pin kit MH186202 sold separately ; 5" x 5"
MH147204 Midnight Farm (2007); Mill Hill; Buttons and Bead Kits; Autumn Series; Beads, ceramic buttons, perforated paper, needles, floss, glow-in-the-dark floss, chart and instructions. Mill Hill frame GBFRM11 sold separately ; 5" x 5"
MH149201 Opera House (2009); Mill Hill; Buttons and Bead Kits; Autumn Series; Beads, ceramic button, perforated paper, needles, glow-in-the-dark floss, chart and instructions.